Not long ago, you can easily find an online bank that pay above 5% APY for your money. For example, from my last rate update at the end of 2007 (I didn’t update the list since them because banks kept lowering their rates even , you could get a 5.12% APY from UFB Direct or 5.05% from E-Trade. However, things changed a lot after the Fed’s 1.25% rate in January. Even when the Fed didn’t make any move between meetings, banks kept dropping rates to the current level around middle or low 3.00% APY. Then last week on Fatwallet.com, there was a thread discussing a bank called Provident Direct, which currently pays 4.50% APY and that got my attention as I am still looking for a bank that offers better than the 3.86% APY from IGoBanking. Provident Direct is the online division of Provident Bank (member of FDIC since 1943) a regional commercial bank that headquarters in Maryland with $6.5 billion in assets. The offers from Provident Direct include both high-yield savings and CDs. 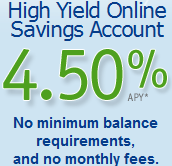 The high-yield savings account currently has an interest rate of 4.50% APY with $1 minimum. According to the discussion on Fatwallet.com, the main concern of this bank is the $5,000/transfer limit on outgoing fund transfers. Though multiple withdrawals can be made in one day, as any other savings accounts, a total of 6 monthly transfers/withdrawals is allowed for this high-yield savings account. This means a total of $30,000 can be transferred out of the account every month. This amount is generally enough, but a little bit low if, for example, you deposit a large amount from 0% APR balance transfer. If the number of withdrawals exceed the monthly limit, the bank can reject the request or impose a fee of $5 per occurrence. $10 annual inactive account fee for balance less or equal to $50; $20 if balance greater than $50. Provident Direct supports ACH fund transfer and from what I read so far, there’s no hard credit check for opening a new account. I may consider using this bank if its rate doesn’t drop too much after the Feb’s expected rate cut tomorrow. BTW, you can find out what other banks are currently offering on the updated interest rate table. Hmmm…. Looks interesting. If they keep their rates up after the next cut I might move there as well. Everywhere else is pretty dismal for rates right now. I didn’t catch is it FDIC insured? Also if you do jump on board or find anything else out I’d appreciate a post on here. I’m hesitant to go rate chasing after having been burned a couple times this year already. First was Discover Bank via the AAA that advertised 3.91% APY. By the time I made my deposit and got access to my account, it dropped to 3.56% APY. Another case is Compass Bank. They advertised 4.00% APY, then it became 3.80% APY (I think). Fortunately, it took so long to get my funds together that I learned they dropped the rate to 1.80% before I could fund the account. I’m afraid that if I go rate chasing to Provident, the day after I deposit my funds, they cut the rate to a pittance. Mickey Blue Eyes: That’s a terrible experience you have. The speed of rate change now is just too fast for anybody to follow. I will wait after tomorrow’s meeting to see the action from Provident Direct to decide whether to get an account or not. If it still has a sizeable margin against other online banks, I think I will get one. Of course, I will post it here my experience.